Dean Peter Sargent and the Stage Management program were recognized by the Stage Managers' Association. 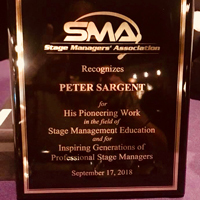 Peter Sargent and Webster University’s Stage Management program were honored at an awards ceremony held by the Stage Managers’ Association (SMA) in New York City on Sept. 17, 2018. The event honored recipients of the Del Hughes Lifetime Achievement in the Art of Stage Management Award, as well as a special award recognizing Sargent and this specialized Conservatory program. At the event, Sargent was introduced by one of the many success stories from the program: Webster alumna Julia Jones (BFA Stage Management ’89), who was most recently the production stage manager for "SpongeBob SquarePants: The Broadway Musical." Write-ups of Sargent and other honorees appear in an article in the September 2018 issue (page 4) of Stage Directions magazine, and the article and more photos from the event are online here. The Stage Management program is unique to Webster's Conservatory of Theatre Arts, with a special curriculum to prepare the aspiring Stage Manager for a career in this highly demanding area.